Senior Musical Theatre is for students in 3rd, 4th, 5th and 6th Year. Auditions are on Sunday 5 November at 10am in ITW Clonskeagh. Please email the office to find out what to prepare for the audition. 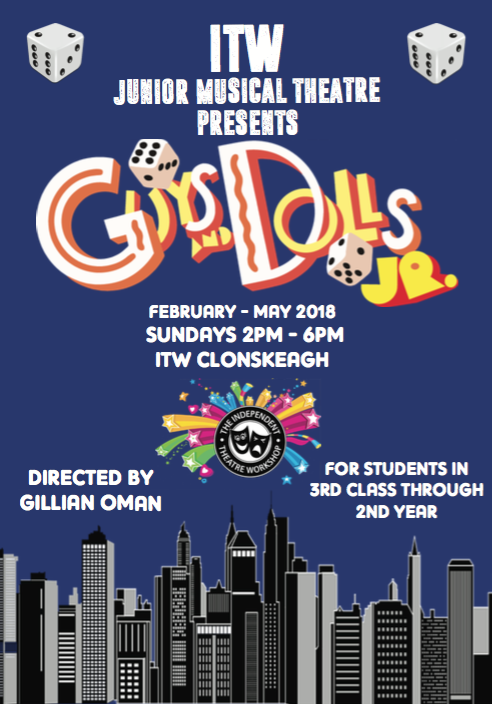 Guys and Dolls Junior will be the Junior Musical Theatre production for students in 3rd class through 2nd Year. Audition dates will be set in the new year, so please enquire with the ITW office if you would like to be kept on an email list for more information. Rehearsals will meet on Sundays from 2-6pm for 10 weeks only beginning in February (breaking for Paddy's Day and Easter Holidays). Please note - all students enrolled in Jr. Musical Theatre must be available during the May Bank Holiday weekend. The show will perform in the Sean O'Casey Theatre for two days in May 2018, dates TBC.